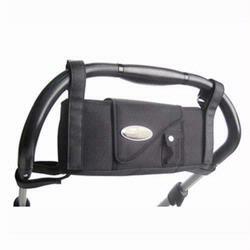 Stroll-Air Stroller Organizer/Console can be used on most strollers on the market. The unique six straps allow the organizer to be attached horizontally or vertically on most strollers on the market. The VELCRO® brand closure straps are padded with rubberized material to prevent slipping from strollers' handles. The organizer has two insulated cup holders, one with drawstrings and middle pocket with key clip, cell phone pocket and zippered pocket for storage. The magnetic closure will not disturb opening and closing.